Capital Group Properties is rolling out a master "clean energy" plan to bring solar to its entire portfolio of properties. Motivated by its desire to help the environment, control facility and tenant costs, and the available state and federal programs, the company is following through on one of its guiding principles to "Conserve energy and protect the environment in our building practices", said Bill Depietri, principal. The first property to be enhanced is their office and light industrial location at 100 Discovery Way in Acton. The property now has a new roof and is powered with a 140 KW solar photovoltaic (PV) electric solution. The solar system, comprised of 660 American made panels and located on the roofing structure via a non penetrating ballasted mounting solution, will generate enough electricity to service all of the property's common areas - the building occupants will truly be helping to reduce carbon emissions. A system of this size will generate approximately 150,000 kilio-watt hours (kWh) of electricity, enough to power 20 homes and avoid the CO2 emissions from 20 cars annually. The system was installed by Solect Energy Development, a Hopkinton based solar project development company that has collaborated with the team at Capital over the past year to implement a solar strategy. "We chose Solect due to their approach in understanding our property management needs and leveraged their solar expertise to help pull together a clean energy solution that met our operational and financial requirements", said Doug Freeman, principal. The next phase for Capital involves a project approximately 7 times the size of the one in Acton and will be the largest such system in the MetroWest area. Solect will be installing a one megawatt (1 MW) land based system in the vicinity of Rtes. 9 and 85 in Southborough. Capital intends to cover 100% of the local common area electric usage at 150 Cordaville Rd. and the excess generation will be used to satisfy the common area electrical costs at other buildings in the Capital Group portfolio. The company is using an approved process which allows a solar system owner to produce electricity at one location and virtually transfer the benefit of the production to another location under common ownership. This benefit is a key component of Capital's strategy. 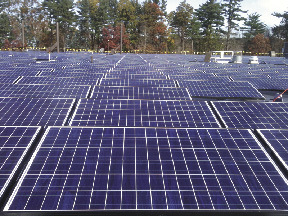 The solar system design in Southborough has been worked on collaboratively with several Town of Southborough Departments including the Conservation Commission, Assessor's office and Building Department and National Grid's engineering team to arrive at a technically and environmentally sound solution. Slated to break ground this spring with approximately 4000 panels installed over 5 acres, the system will produce enough electricity to power close to 150 homes and equal the carbon sequestered from approximately 20,000 trees grown for 10 years.